The term "new media" is most often associated with the Internet and the phenomenal technological advances that have taken place in the past decades. 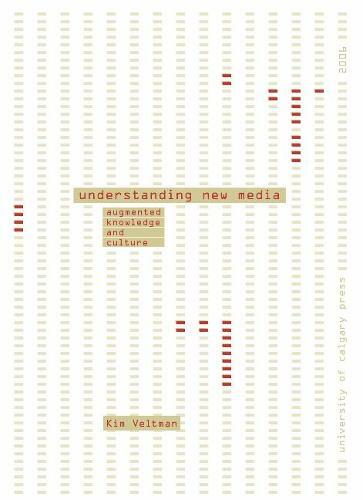 In Understanding New Media: Augmented Knowledge and Culture, Kim Veltman looks at these developments and identifies five types of consequences of the networked environment - technological, material, organizational, intellectual, and philosophical. Veltman reviews physical changes (e.g., development of size and speed in computing, wireless communication, agile manufacturing) and argues that the most profound potential changes lie in intellectual and philosophical domains. Unlike technological determinists, Veltman shows that there are at least three differing and sometimes competing goals and visions for new media around the world. Whereas America foresees an information highway, Europe envisions an information/knowledge society and Japan strives clearly for a knowledge society. China and India are playing an increasing role in such visions of the future. These visions are very long-term. For instance, the director of Google has claimed that his (American) vision will take at least three centuries to achieve. Veltman thus reveals a big picture of the digital revolution that is something fundamentally different from simply the introduction of yet another medium to our culture. Information Communication Technologies (ICT) are becoming Universal Convergent Technologies (UCT). This calls for us to rethink McLuhan's brilliant and provocative suggestion that every new medium simply uses the prior mode as its message. It marks a paradigm shift in our relation to all media, to all our senses, all our expressions. The new media are transforming our definitions of culture and knowledge, our ways of knowing, and transcending barriers in ways that will have lasting implications for centuries to come.